Mamá was an alien. Papá didn’t have a card, so he was not an alien. That meant I was half alien. I looked like a human girl, so my alien parts were hidden. But I needed to find out which half of me was hidden. Could I be alien from my head to my belly button? Or from my belly button to my feet? Could I be alien only on my right side or only on my left side? It’s only after 23 pages that Sofía discovers the term “alien” has more than one meaning (“alguien de otro planeta o alguien de otro país”) and becoming a US citizen is easy and equally attainable by all. And that’s this story’s fatal flaw. While Colato Laínez’s writing is humorous and endearing, his Spanish translation is very good, and Lacámara’s bright, acrylic-and-collage artwork is appealing, the story ignores the inequities and dangers that immigrant and refugee children and their families must endure, and glosses over the issues of who gets to become a citizen and who doesn’t. Mamá the Alien is sure to resonate with well-meaning teachers and librarians looking for picture books that are relevant to contemporary issues. 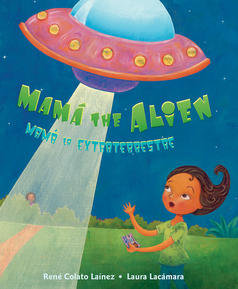 And Mamá the Alien will surely be a hit as a read-aloud in bilingual early childhood classrooms. No doubt, refugee children will sit, heads down, confused and shamed and not understanding why. We are living in a scary, dangerous time. Especially for undocumented children and their families, this fact cannot be disputed. Confused, scared, unaccompanied children who are running for their lives—to get to the “safety” of El Norte—more often than not find themselves in detention centers, waiting for strangers to decide their fates. And others may hide for years—sometimes with extended family members who live in the US—in fear of being caught and sent back. Their lives must be kept secret, even from their classmates and friends. The same issues come back again and again and again and again. Children who are not enmeshed in this difficult life, whose citizenship has never been questioned, need to be taught to challenge these inequities. They need to be taught to recognize the pain and call out those who demonize immigrants and refugees, and to become allies in what might seem to be an impossible struggle. The conversation is necessary. It’s beyond excuses. The publisher’s note enthuses, “The book’s bilingual text makes it an especially good fit for English language learners who may struggle to find books that reflect their experiences,” and Mamá the Alien has garnered raves from the major review journals. As the Booklist reviewer wrote, “[this] heartfelt and humorous story is perfect for primary-school readers, as well as a useful way for parents or educators to introduce the topic of immigration.” And the Kirkus reviewer called it “a delightful, original, clever, purposeful, multicultural alien tale.” Unfortunately, all are missing the point. While I do not doubt the good intentions of the author and illustrator, both of whom are immigrants, Mamá the Alien / Mamá la extraterrestre trivializes the pain that so many children and their families undergo and makes light of migration issues that have yet to be resolved in this country. It cannot be recommended. Míl grácias a mi colega, Oralia Garza de Cortés. What a missed opportunity! The stories we tell both reproduce and transform the future. At the time when they are forming their ideas about justice, democracy, immigration, fairness, we need to offer children stories that illuminate some basic concepts of equality, inequality and justice as they play out in their and their friends’ daily lives, and that feature ordinary people building a better future for everyone. It is telling that the major reviewers do not use a social justice lens. Teacher, librarians, parents and grandparents need to provide children with story books that promote thinking about roots of social suffering and collective responses to it, to stand alongside fantasy, historical fiction, and mysteries on every classroom, library and home bookshelf. Thank you for your comment, Ann. I agree, and let me add that books that promote thinking about inequity and how we can remedy it can and ought to stand alongside--and be incorporated into--fantasy, historical fiction, and mysteries in the classrooms and public libraries as well. Wow, I'm floored by your comments about the U.S. officials sworn to uphold our laws, even the immigration laws with which you disagree. Comments such as "While a nasty, hateful, racist xenophobe may become the next US President, the current President has unleashed thousands of Immigration and Customs Enforcement (ICE) agents to ensure that raids and dragnets remain commonplace" are not helpful. All countries have the right to define and defend their borders, and to define refugee and other immigration statuses. Of course "strangers" will decide their fate! If the book is unrealistic, say so, but your rant is unhelpful. One person's rant is another person's strongly held and clearly stated expression of belief. In the dominant US culture public expression of feeling-- in this case despair, fear and anger --is shunned and considered inappropriate, and is often referred to in terms that have a negative valence such as "rant." Thank you, Leslie. My wording was extreme and I’ve removed it from this review. It’s true, as you commented, that “all countries have a right to define and defend their borders.” At the same time, those of us who work in education must strive to teach the truths of history and contemporary events—even the unsavory truths. These include, for instance, the disastrous results of US immigration laws and policies. Refugee children (often unaccompanied) from Central America and Mexico are fleeing to El Norte as a result of rapacious US political and economic policies, such as NAFTA, that have all but destroyed their lives. I’m not saying, of course, that we need “NAFTA studies” for kindergartners, but I’d like to see more children’s books such as Jorge Argueta’s Somos como las nubes / We Are Like the Clouds and Alfredito Flies Home // Alfredito regresa volando a su casa; and Jairo Buitrago and Rafael Yockteng’s Two White Rabbits // Dos conejos blancos, rather than an unrealistic book based on a word play of a hurtful insult.